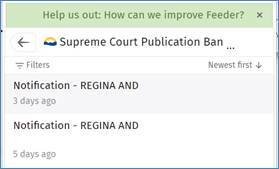 The Publication Ban Notification Project provides the public with timely information regarding applications for discretionary publication bans or to exclude the public from the courtroom. The Project applies only to criminal and quasi-criminal proceedings in the Vancouver and New Westminster Supreme Court registries. 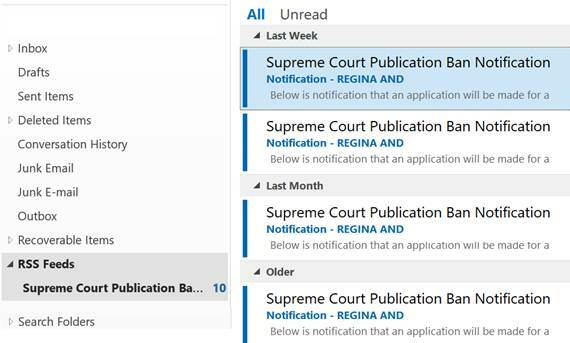 A party in a criminal or quasi-criminal proceeding who intends to apply for a discretionary publication ban or to exclude the public from the courtroom is required by practice direction to complete a notification form. The information in that form is then transmitted by RSS. Please consult the practice direction for detailed information regarding this Project, including a list of applications that trigger the notice requirement. To view our RSS feed, simply copy this URL into your RSS news reader of choice. For those on the legacy email notification service that would like to unsubscribe, click here. 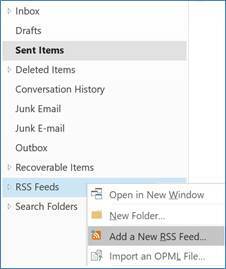 Below are methods of implementing RSS on various platforms, or use the RSS reader of your choice. The feed should now be added to your RSS Feeds list. From here you can choose to follow the additional prompts to set up an account. The following instructions will set up the feed without an account. You will be presented with a dialog to Subscribe to the feed. Click Subscribe. The page will then show you a confirmation. Click on the Feed Icon. 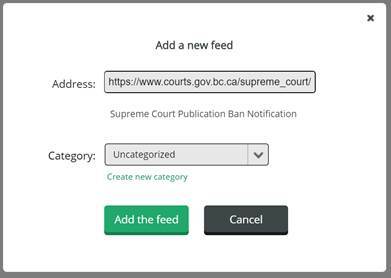 Clicking on a specific item will take you to the BC Courts website for additional detail. Click on the following link to see the full RSS feed. Once you have created an account. Click on the Add a new feed link, near the bottom of the page. The feed will open and appear on your list.